The following series is meant to show you the fastest way to get the a Laravel Forge server deployed to Digital Ocean or AWS with a Maria DB behind a Galera Database Cluster running behind a load balanacer for the web app. Part 1: MariaDB + Galera Cluster running with 3 Servers with read/write access that will automatically sync with each other. 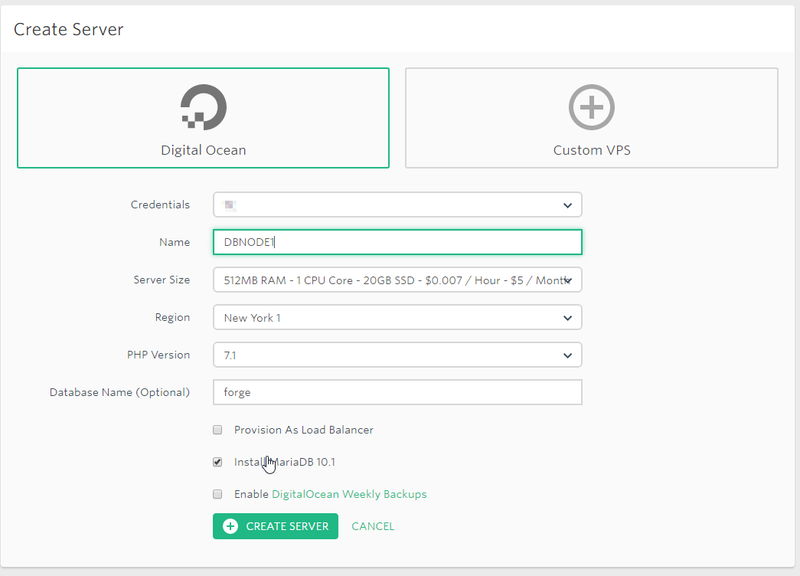 Part 2: A load balancer in DigitalOcean that will Round Robin between your 3 data bases. Part 3: A DNS entry in your domain name to create dbloadbalancer.yoursite.com in order to easily reference it on your .ENV file on your laravel project. Our servers will be called called DBNODE1,DBNODE2,DBNODE3. 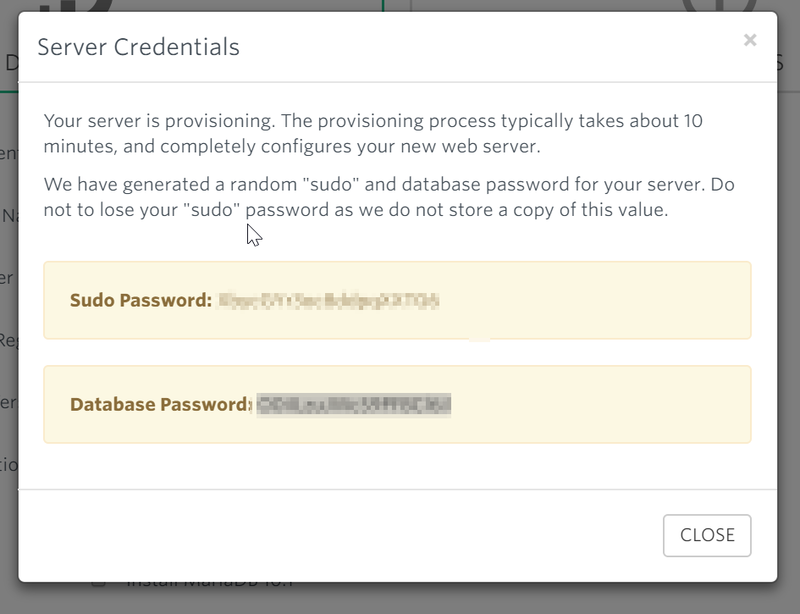 Forge will provide you with a sudo password and a database password. Grab the information from each server on a secure place. I will put them on an Airtable for now. As you can see Laravel Forge just saved us a lot of time by creating the servers with MariaDB, creating the sudo user and the root database password. Also Taylor (Creator of Laravel) mentioned that the servers deployed with Envoyer are kept up to date with the latest security patches. Login to every server and create the following configuration file for Galera Cluster. Don't know how to login to your server? Click here to learn. In my case I'm using MobaXterm to login to all servers at the same time. Where: 10.136.49.168,10.136.5.203, 10.136.47.33 are the private network IP addresses from Digital Ocean. Congratulations you have almost everything you need for a Mysql dabase cluster. You can add more servers if you need to. Please note only the first server starting in the cluster should be started with this script. The other servers should be started normally. mysql -u forge -p -e "SHOW STATUS LIKE 'wsrep_cluster_size'"
You will be asked to enter the Database root password that was given to you during the creation of the servers. The ones you saved in Airtable. Good job! you have the first node in your cluster running. The reaining nodes will connect to this node. Ok, that was too easy! You got a Cluster with 3 servers running. You can write to any of them and they will stay synced. In the next tutorial I will show you how I connect to all 3 servers using a load balancer (Round Robin). Please take some time to read the manual from Galore. For example what if the power goes out and all servers get disconected? You will need to start the last active server. There are very clear instructions on the Galera website that explain this process. here. Most Galera related questions you can find online. I hope this quick tutorial was helpful. I will post the load balancing tutorial in a few days.